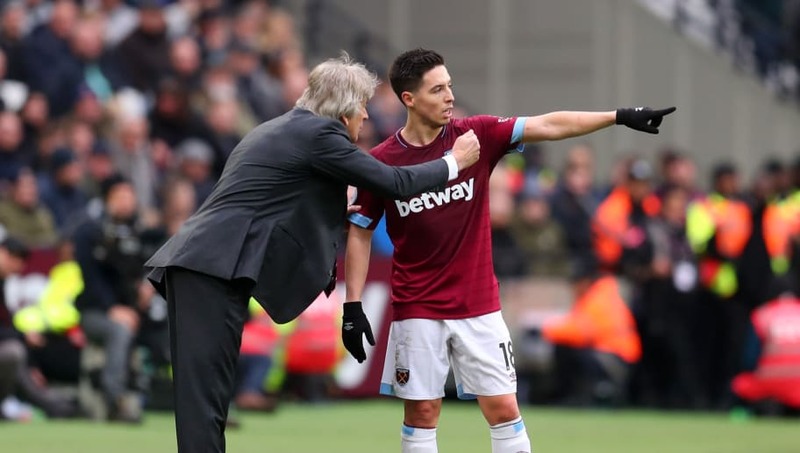 ​Manuel Pellegrini has stated that he is unsure of what the future holds for Samir Nasri after the West Ham midfielder picked up his third injury since joining the club during Monday's defeat at Chelsea. The 31-year-old signed a six-month contract at the club on 1st January but has since made only six appearances for the Hammers after more than a year away from football since serving a doping ban. He started on the bench in ​West Ham's defeat at Stamford Bridge, but inured himself while warming up during half time, meaning he won't feature in Saturday's ​Premier League clash at Old Trafford. Pellegrini has remained tight-lipped regarding the former ​Arsenal midfielder's future at the club while speaking ahead of the weekend's matches, having initially wanted to offer the player a full time contract at the end of the current season. "About next season, I don't know," the Chilean said (via ​Football London). The same report claims that Nasri wants a two-year contract to stay at the club, with wages of around £70k per week plus bonuses. Having worked alongside Pellegrini during their time together at ​Manchester City, the West Ham boss' faith in the creative midfielder has been evident, opting to use Nasri whenever fit - contributing two assists in the Premier League this season. With the Hammers currently 11th in the division, they have the chance to continue their push for a European spot when the travel north to face ​Manchester United on Saturday evening.